Queen sixth studio album "News Of The World" was recorded at Basing Street and Wessex Studios in London from July to September 1977. It was released on 28 October 1977 in the Uk and on 1 November 1977 in the US. 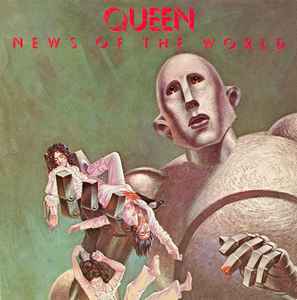 This grouping gathers together all versions of the "News Of The World" album, originally released in 1977 on vinyl and tape, as well as subsequent repressings and bootleg versions. Officially, the entire back catalogue was re-issued for the first time on CD in 1986, and again on CD/tape in remastered form in 1991 for the US market (via Hollywood Records, adding a few non-album tracks or remixes not included on the original versions). Parlophone also re-issued the remastered versions in 1993/1994. In 2009 the entire back catalogue of studio albums (newly remastered) was re-released again, this time on heavyweight vinyl. Additional CD versions appeared in 2011 in standard and Deluxe Edition packages (the latter including a second disc with sparse bonus tracks) via Island Records to commemorate the band's 40th anniversary. On November 17, 2017 the 40th Anniversary Edition of the album is released, in box set form. IMHO, this is the best mastering of News Of The World. Terrible reissue. Sound is compressed and Brian May's guitar is particularly muffled and distorted. Labels show R-134355-A and B in black text (rest of label written in red on Queen's artwork), and show 6E-112-A and B, STEREO, and SP on the right side. Also on the label: Mfg by Elektra Asylum Nonesuch Records, and the copyright date is absolutely 1976, not 1978 as I've seen on most of the other releases of the time. Runout has R134355A and B stamped, followed by O-1 stamped (def O, not C), then SM1-1 etched. Side 2 has E A S T stamped around spindle hole. Liner sleeve is red with white writing, has lyrics on both sides, hole diecut on one side, and pic of band on other side. Sleeve is the standard gatefold at 90º, with no text other than Elektra Asylum's address notes (no club markings). A very odd hybrid to what I've seen recorded by others on the site. I wonder who actually made this, and why. Excellent thing, if you can, buy it or listen. Mr. Bob Ludwig and Miles Showell did a great job. The record plays perfectly and I give 5 stars out of five. Frequently there is everything to be heard, sound is excelent good, dynamics absolute, stereo bases amazing. Sound from Studio-Abbey Road is great and amazing transparent. I like this 1/2 speed version. Why is there no printing on the spine of the box!? Wonderful. This box set makes me well-up with joy. I have been a fan since 1976 when I bought Queen II @ 9 years old. I don't care how much alimony Brian has to pay, as long as fine product like this rises to the top, I will buy it. I A, B, & C'd this with a 1st print & the Green Studio Box. The 40 Anni. won. It's quieter & more dynamic. Hope they give the same treatment to The Game, The Works, The Miracle & Innuendo...too late for Jazz. Definitely one of the better-sounding 70's-era Canadian-pressed Queen releases. The top end is a little on the bright side, but that's fine by me, and pretty much the whole thing has very good bass, presence and immediacy - the vocals in particular sound awesome. Even the smashed-to-the-wall compression of "Sheer Heart Attack" (the song not the album) doesn't hold it back one bit - the sonic immediacy allows it to attack you at full force while being enjoyable at any volume, with absolutely zero fatigue.